To set the units of measurement throughout Anova, please go to top right menu where you can see your name. Settings - Preferences. Your selections here will change the units for both rounds/courses and the displaying of statistics throughout Anova. Hole Distance: This is the unit of measurement that the holes are displayed in. For example, you can add a course in yards and have it displayed in yards. Shot Distance: This is the unit of measurement that you are adding to each hole in the "add a round" section. On each hole and each shot you will be asked to enter the distance to the hole, and this selection determines if those shots are expressed in yards or meters. Putt Distance: This is the unit of measurement that is used when you are on the green. Note: In almost all cases, users will have the same unit selection for hole distance and shot distance. 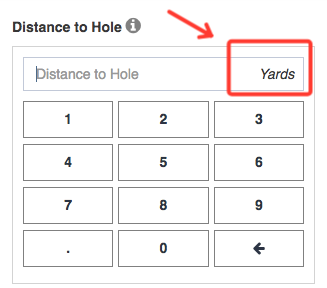 Example: I want the hole distances to always be displayed in yards (regardless if they are entered into the database in meters). Anova will display all the hole distances in yards, and recalculate all of the distances for courses entered in meters to yards. Example: I want a different unit for putting. I am using meters for shot and hole distances but want to use feet for putting. Then you need to change the "putt distance" selection to "feet. In the "add a round" section, you will be reminded of what units you are using.